An Edmonton Conservative MLA is blaming his wife for a failure to pay property taxes on their rental properties. Conservative MLA Carl Benito speaks to reporters at the Alberta legislature Tuesday. (CBC)An Edmonton Conservative MLA is blaming his wife for a failure to pay property taxes on their rental properties. 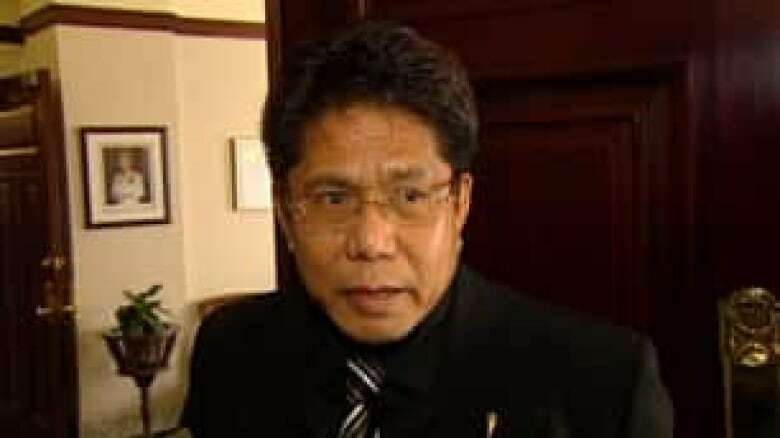 Edmonton-Mill Woods MLA Carl Benito said he paid the amount to the city Tuesday morning. He told reporters he believes the amount owing on the four properties was around $8,000. The overdue taxes were made public a day earlier in a report from the province's ethics commissioner, Neil Wilkinson. When he was elected two years ago, Benito said his wife agreed to take over the job of paying the couple's bills. She recently went away on holidays and failed to pay the tax bill, he said. "I trust my wife that she takes care of those kind of things but sometimes some other things are more important to the wife and going on holidays, I guess, is more important to her than making sure that paying property taxes [are], you know, the primary responsibility." Benito said he isn't trying to hide anything, as he reported the non-payment to the ethics commissioner earlier this year. Despite repeated questions from reporters, Benito didn't clarify why he didn't pay the overdue taxes sooner. "We have several properties that we rent ... it's not my department or my responsibility," he said. "I made an agreement with my wife that the paying of some of the household responsibility is her department." Edmonton-Strathcona NDP MLA Rachel Notley couldn't believe that Benito put the blame on his wife. "That's at a level which is simply not something anyone could reasonably pass off to an oversight on the part of their spouse. That's just silliness. That's laziness,"she said. The ethics commissioner's report details travel and gifts exceeding $400 that Tory MLAs and cabinet ministers received in 2009. No one from any of the opposition parties declared any gifts. Edmonton-Calder MLA Doug Elniski said his food and bar tab was covered by a company when he went on a salmon fishing trip. Northlands provided Employment and Immigration Minister Thomas Lukaszuk tickets to a Lady Gaga concert in August. Treasury Board President Lloyd Snelgrove attended a Fleetwood Mac concert with his wife and son with tickets provided by Telus. "We had an offer from a gentleman who works in the community relations side of Telus that is a very good friend," he said. "The donation of the tickets was cleared by the ethics commissioner. As a matter of fact, they were of less value than we needed to even declare." A former advisor who is a lobbyist for AltaLink provided Education Minister Dave Hancock with tickets to a Rod Stewart concert. Hancock said he didn't breach any ethics rules as he had the gift approved by the ethics commissioner. "As a matter of a public role I go to lots of things," he said. "This one happened to be a little different because it's a Rod Stewart concert not an opening of the Citadel season or an opera or an arts community thing or whatever. It's part of what we do. You know, if a friend called you with two tickets to a concert, would you go?" Hancock said his positions on public policy are not affected by any of the gifts he might accept from friends. But Alberta NDP Leader Brian Mason called on Premier Ed Stelmach to start barring his ministers and his caucus from accepting gifts. "These people are not giving these MLAs gifts and travel and so on because they're really kind, benevolent people. They're doing it because they want something," he said. "They want the government to help their companies and that's wrong." Alberta Liberal Leader David Swann said he was "disgusted" by the report's revelations. "This is not adding to credibility, trust. It's breeding more cynicism and distrust of the political system in Alberta," he said. "It has to change." Wildrose Alliance Leader Danielle Smith said ministers should reveal who they meet with and what was discussed. "I think that would alleviate a lot of the public's concerns about what is actually going on behind closed doors," she said. "I don't think anybody can be bought for the price of a Lady Gaga concert ticket but what I do worry about is what kind of conversations are going [on] at that meeting."